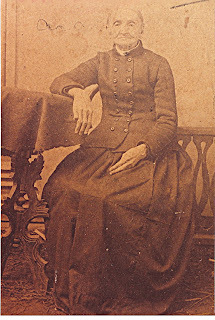 Emily Coleman Morgan Kilpatrick, photo from Hall family collection, probably taken in Bienville or Claiborne Parish, Louisiana. Emily Coleman Morgan was my 3rd-great-grandmother, the daughter of tobacco farmer John William Morgan and Sarah Elizabeth "Sally" Coleman. 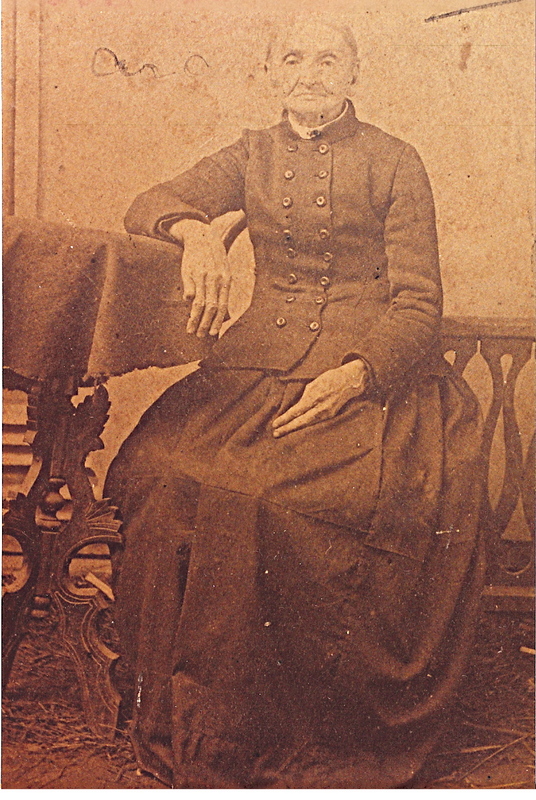 She was born 28 Dec. 1820 in Mecklenburg County, Virginia. Her family moved to Franklin County, Tennessee about 1833, where she met and married John Milton Kilpatrick. Kilpatrick was hired by Emily's father to teach him to raise corn; he stayed with the family for four years and ended up growing a crop of Morgan grandchildren as well--including my great-great-grandmother Hannah Kilpatrick Stevenson Dobbins. Emily's granddaughter Loda Duckworth confirmed her formidability in a memoir: "Grandma was never afraid of anything, not even a bucking horse, she could ride like a man, get on a horse and go out and tend to business as well as any man." Loda wrote (or told to someone) more colorful history about the family; when I find out more, I'll post a link to read or buy if possible. I believe it may be part of a published family history. After brief stays in Mississippi and Texas, John and Emily finally settled for good in Arcadia, Louisiana, just before Christmas, 1859. John died in 1863; Emily lived another 36 years and moved again to nearby Athens, passing away either there or in Arcadia on 14 May 1899. She and John are buried in Arcadia Cemetery. Next week on "Tombstone Tuesday," I'll tell you how a photo request regarding her turned into a bit of genealogical serendipity. Sources: Memoir of Loda Duckworth, excerpts in my possession; Arcadia Cemetery transcription by Maxine Morgan (no relation to my Morgans, though her husband is a Cotter cousin) at USGenWeb Archives; U.S. Census records; Tennessee State Marriages, 1780-2002, at Ancestry.com; Findagrave.com; original research of Mary Urban (note: her research is well documented, despite the lack of sources at that link); additional notes in my possession from others. Please note that Emily's family is a work in progress. Questions, corrections, additions? Contact me at hallroots [at] sbcglobal **dot** net. Copyright © 2012 Liz Hall Morgan, all rights reserved. Read more "Treasure Chest Thursday" posts at Geneabloggers. Liz, Loved this post! Will be sharing a link to my Spurlock cousins who are descended from Emily! I'm a Southwest Louisiana native and Cajun "expatriate" exploring a multiplicity of heritages, all of which improbably converged in Louisiana. I enjoy sharing genealogy tips, finds and family stories. Questions, corrections or additions welcome: hallroots (at) sbcglobal (dot) net. My heritage includes British Isles ancestry through my N. La. ancestors; Cajun, French-Canadian, & Irish ancestry through my S. La. ancestors; and French, French-Canadian & a bit of German ancestry through my Colonial New Orleans, Mobile, & French Illinois ancestors. All photos and text are copyright 2009-2014 by Liz Hall Morgan unless otherwise indicated. All rights reserved. You may NOT use the contents of this site for commercial purposes without explicit written permission from the author and blog owner. Commercial purposes include blogs with ads and income generating features, and/or blogs or sites using feed content as a replacement for original content. Full content usage is not permitted.